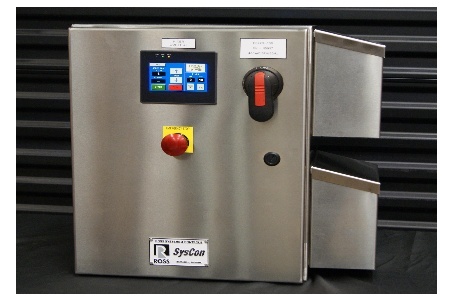 Ross SysCon, a worldwide supplier of process control and automation systems, builds UL-rated stainless steel control panels of virtually any size or complexity. Shown is a Single Axis Control System in a NEMA-4X stainless steel enclosure for soft start and variable speed control of a Ross Ribbon Blender. A 4” color touch screen is mounted on the panel door for control and viewing of agitator speed, load, cycle time and forward/reverse agitator direction. A Variable Frequency Drive, Emergency Stop button, fused rotary disconnect switch, branch circuit protection, interlocking safety circuitry and fan shrouds are included as well. This UL-rated panel is built to conform to NFPA 79 standards. Ross SysCon is one of five US manufacturing facilities under the Ross group of companies. Ross, a manufacturer of mixing, blending, drying and dispersion equipment, also operates three international plants in China and India.